Could Tree Houses be the Future of Property Industry? More skyscrapers are currently being built around the world than ever before. As the property industry develops, skyscrapers are becoming very common in densely populated and modern cities. The majority of skyscrapers are built using the same steel or concrete structures, introduced back in the 19th century when they were first constructed in New York and Chicago. This could all be set to change soon though, as one of the oldest construction materials available, timber, is being reinvented and used to build new skyscrapers. Vancouver architect, Michael Green, has proposed the development of a 35-storey skyscraper made using a wooden structure. 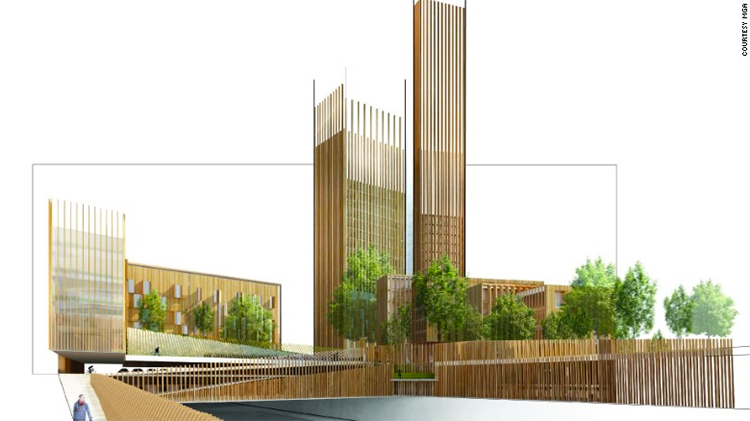 This timber-supported tower will form part of a six-tower development in Paris, called Baobab. If built, Baobab would be more than three times taller than the Forté Apartments in Melbourne, which are ten-storeys high and currently the world’s tallest timber building. Stadthaus is currently the UK’s tallest timber building, standing at nine-storeys high. Michael Green’s MGA firm partnered with French architectural partners DVVD and real estate group REI France to propose Baobab as part of Reinventer Paris, a design competition that requested new ideas for how the city’s architecture could be rejuvenated. The Baobab complex would include a student hotel, plenty of green space, an e-car hub, and a bus station. The idea behind it is that the timber skyscraper would help fix Paris’ current housing situation in a creative, environmentally friendly, and sustainable manner. "Eiffel's vision redefined the skylines of the world, eventually (starting) the race for height in places like New York and Chicago in the 1920's and 30's and even. "We love the idea that a wood tower in Paris, however modest in some respects will help champion a new global wave of building with more sustainable, renewable and beautiful materials,"
While there are currently no plans to actually build Baobab, the architectural development of tall buildings made from timber is being seriously considered in a variety of different places around the world. The HoHo building is a 275-foot almost completely wooden structure that’s due to be built in Vienna next year, and a 34-storey apartment block made of timber could be constructed in Stockholm by the year 2023. Wood is a great construction material and has many different benefits. It’s a very dexterous building material and of course has strong environmental credentials. Cross laminated timber is a strong, reliable building material and is popular for creating walls, floors, and roofs. Although wood is a great renewable material that offers us a whole new focus for the future of property development, there are still some downsides to using it in construction. Unfortunately, the potential for an increased fire hazard is high, and wood is also yet to be cheaper to use that concrete or steel. The construction industry is constantly developing, and these wooden skyscrapers, or “plyscrapers” as they are now being referred to, could well be the future of commercial and residential property.